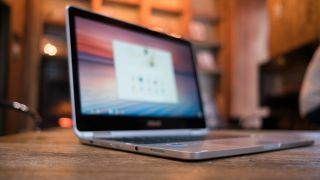 There’s a new Chromebook in the works offering a couple of nifty innovative features, namely the addition of a fingerprint reader and a dedicated button to fire up Google Assistant – and the notebook may even be produced by Google itself. The Chromebook in question is codenamed Eve, and the details on it come from Chrome Unboxed, which has been monitoring various leaks and comments on the potential machine that Chrome OS developers have been chiming in with since last year. The laptop has apparently been under development for eight months now, and while this is all very much in the speculation department, Chrome Unboxed believes that the device will run with a Kaby Lake processor, along with a 2400 x 1600 resolution display (3:2 aspect ratio). As mentioned, a fingerprint scanner is also expected to be part of the recipe for tighter security, and there will be a dedicated key for Google Assistant – which may be implemented alongside a ‘wake on voice’ capability. Eve will be a convertible laptop, and the tech site also believes it will have a backlit keyboard, along with a stylus and an improved trackpad. Google back in the game? Interestingly, while it’s not clear who the manufacturer of this Chromebook could be at this point, Chrome Unboxed theorizes that it may be produced by Google itself as opposed to a third-party laptop vendor like HP (a firm which has been previously linked to the device). Google killed off its high-end Chromebook Pixel earlier this year, confirming there were no plans to make another model carrying the name, but the company took the trouble to clarify that this didn’t mean it would never make another Chromebook; there just weren’t any immediate plans to do so. Perhaps, then, Eve could be the next Google-branded laptop, and a new premium model to help show off the power of Chromebooks with these nifty sounding fresh features. Assuming Eve does come to fruition, regardless of which firm actually manufactures the notebook, it’s certainly going to be an interesting offering for those in the market for a higher-end device like Samsung’s Chromebook Pro.